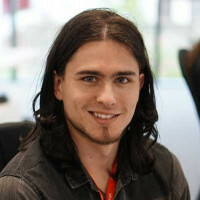 A specialist in graphics programming and visualisation technologies with a 1st class honours degree in Computer Games Programming, Andrew has been championing the use of cutting-edge rendering techniques in the commercial sector for several years. Working at the forefront of industries like automotive and oil & gas, his work has contributed to numerous projects with extensive international impact. Andrew currently plays a key role in ZeroLight's core tech team, developing ground-breaking live retail experiences and leading the innovation on a range of concepts, including the award-winning AR collaboration between ZeroLight, Meta & Ultrahaptics at CES 2018. In the world of automotive visualisation, we create some of the highest detailed real-time graphics ever seen. This realism is extremely important in VR, to immerse the user in a believable virtual world. The greatest limitation so far has been the hardware - in this session we will be covering details of the next generation headsets and the optimisations that can be used to achieve high quality visuals and great performance. Find out how ZeroLight optimise next-gen VR to achieve great performance for automotive experiences with wider FOVs and higher resolutions.